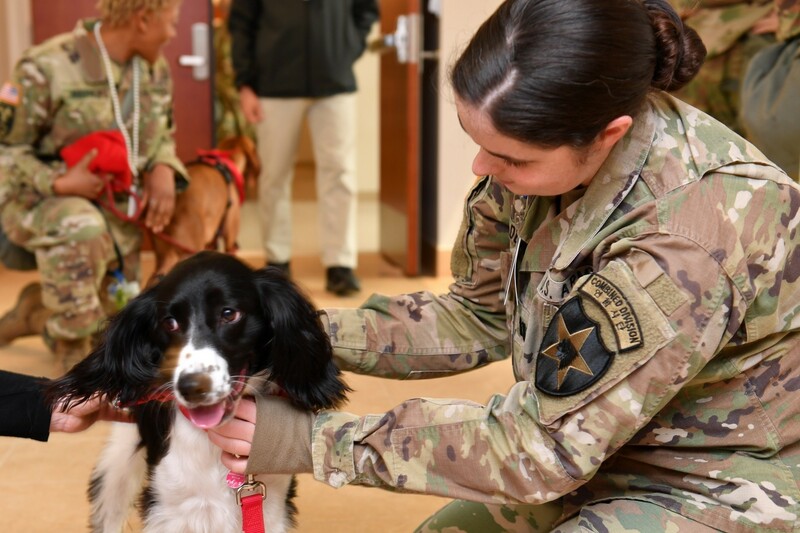 CAMP HUMPHREYS, Republic of Korea - Petting man's best friend brings instant joy to most people. Especially those serving overseas, thousands of miles away from their loved ones. American Red Cross dog teams navigated the corridors of Freeman Hall to help 2nd Infantry Division/ROK-U.S. Combined Division Soldiers unwind during their busy day, March 28. 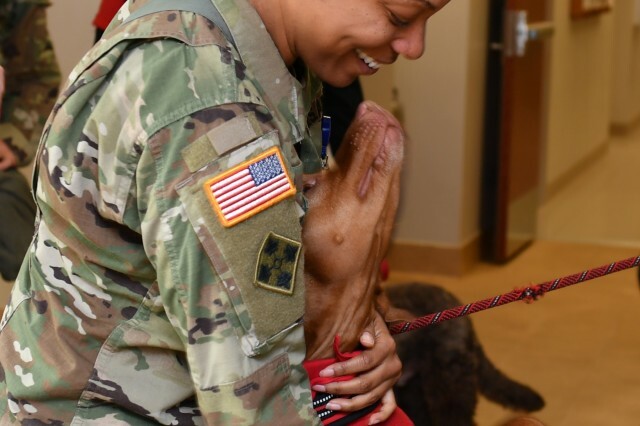 "The unexpected dog visit helped me feel less homesick," said Capt. Catherine Felder, Strongsville, Ohio native, engineer officer, 2ID/RUCD. "I'm serving an unaccompanied tour and have pets back home in the states, so it was definitely refreshing to pet the dogs." 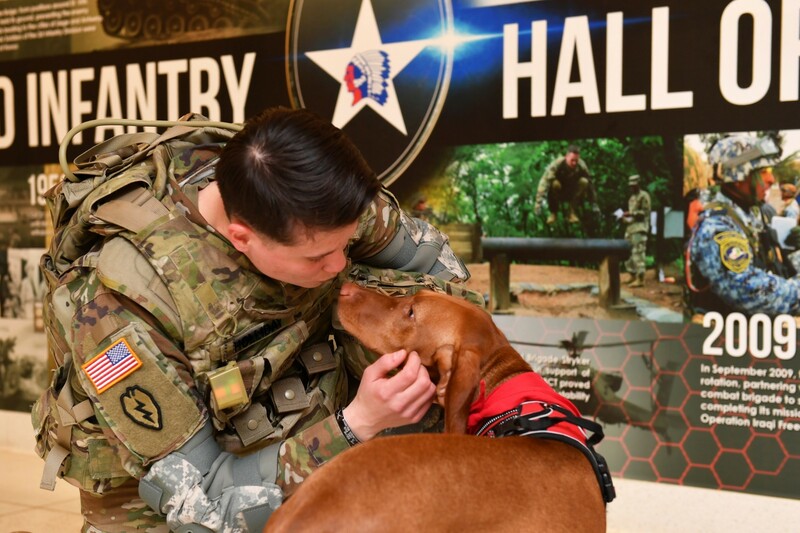 There are currently 11 dog teams at Camp Humphreys who bring love and comfort to Warriors. 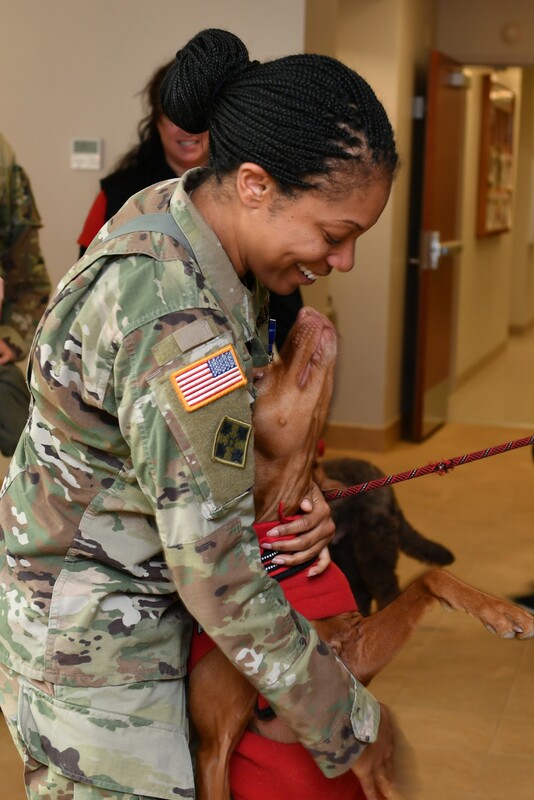 "The intent of the dog visits is to boost morale, mental health, and relaxation at the workplace, hospitals, wellness center, all around post," said Michelle Gilbert, Portland, Oregon native, animal visitation program lead, Camp Humphreys American Red Cross. "Having dogs around is so relaxing that we are also involved in a weekly program at the library called 'Read to a Dog,' where every Saturday between 10 a.m. and 11 a.m. children find it easier, and less stressful to practice reading to dogs." 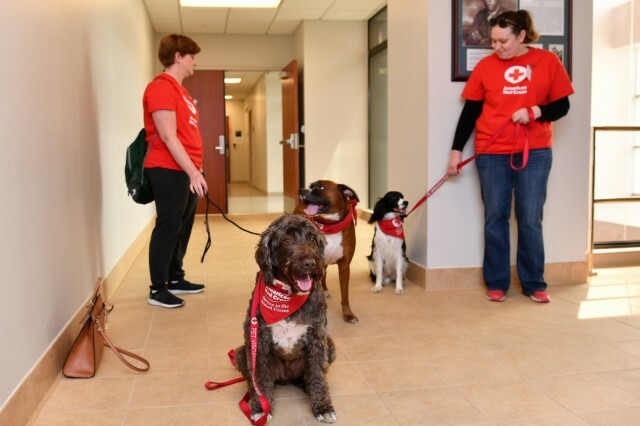 Any dog that's older than one-year-old and passes a behavior test is eligible to serve on a Red Cross dog team. "In order to be a member of a dog team, the handler needs to possess an AKC (American Kennel Club) canine good citizen certificate for your dog, which serves as a baseline for behavior, and then we assess your dog to see what type of events your dog qualifies to attend," said Gilbert, the owner and handler of a three-year-old Portuguese water dog named Makai. The pet therapy program is a part of the Red Cross Service to the Armed Forces program. Other SAF include emergency communications, linking members of the armed forces with their families back home, financial assistance in partnership with military aid societies, as well as programs for veterans. The American Red Cross shelters, feeds and provides emotional support to victims of disaster; supplies approximately 40 percent of the nation's blood; teaches lifesaving skills; provides international humanitarian aid; and supports military members and their families. The Red Cross is a not-for-profit organization that depends on volunteers and the generosity of the American public to perform its mission. For more information or to request a dog visit, please email SAFHumphreys@redcross.org or visit them on the Camp Humphreys Red Cross Facebook page.